Anamorphine shares a story about a loving relationship hit by adversity and turmoil. See through Tyler's eyes as his love, Elena, suffers a tragic accident that takes away her passion and livelihood as a cellist. Their relationship is forever changed, and Tyler must now work through his own personal struggles to find peace. 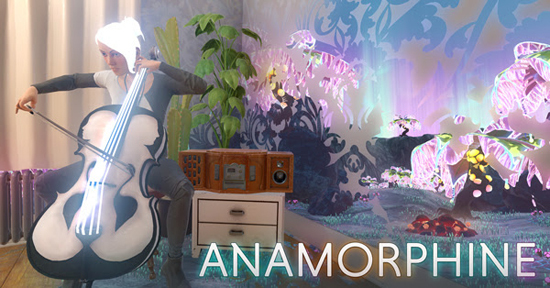 Told through pure environmental storytelling, Anamorphine eschews dialogue and UI in favor of uniquely surreal scenes and a breathtaking cello-focused soundtrack. We are so excited to announce that Anamorphine and its Official Soundtrack came out on July 31, supporting PC, HTC Vive, Oculus Rift, and PS4. You’ll be able to buy it on the PS4 store, Steam, the Humble Store, Green Man Gaming, and if you’re in South America, Nuuvem - it’s good to have options! Last week we went Gold on PS4, a milestone we’ve been working towards since November 2017. Ramy, Mehrdad and Mo have been complete heroes, wrestling with crash after crash on PS4 for more than seven months. To quote Ramy, “We ate a big fat slice of humble pie,” which more or less sums up the entire process of creating this beautiful, insane passion project of a game. That said, we’re thrilled to show you the results of all of that pie-eating. We hope you’ll tell us what you think (our Discord is a great place to do that! ), sign up to our newsletter to stay in touch about launch day itself and get behind-the-scenes info on the game and its development, and share the news with your friends. We’ve spent countless hours in Unity. Traveled across North America, Europe and the Middle East to show it at festivals. Been included in research projects! Basically, we’ve learned more than we could have possibly imagined. We can’t wait for you to play Anamorphine next week! The flat and VR versions of the game are one and the same, so if you buy them anywhere, you can play them with your Oculus or Vive. We might come to the Oculus store itself later. We’re planning our PSVR launch for later this year.